to get out of it in a hurry. The crew nick named him Gremlin. I don't dare try to take it out. this is a picture of a picture. Take the photo to a restoration specialist and have them restore it (before it crumbles). This is not an expensive process and they can/will digitize it so it will be preserved forever for your family. 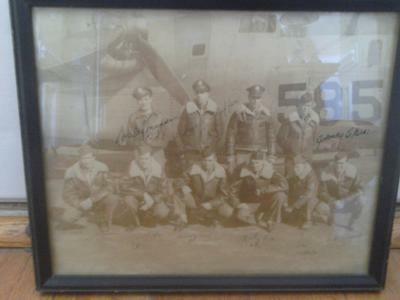 I have done it with several of my dad's photos from the 376th (2LT John Horn, 513th Sq) and have been amazed at the results.